600 denier Carbolex shell with 1680 denier Ballistic polyester knee panels for comfort, durability, and abrasion resistance. Rain guard waterproof, breathable barrier. Phoslite reflective material panels and piping for increased nighttime visibility. Durable 1680 denier Ballistic polyester seat panel to minimize slipping. Double-stitched construction throughout. Dual-elastic panel waistband with adjustable waist belt to fine-tune the fit. Accordion-style expansion panels at the rear waist and above knees for increased flexibility. Two zippered hand pockets with waterproof lining. Removable, CE-approved knee Armor with Tourmaster three position knee Armor alignment system as well as removable soft hip Armor. Stretch materials in the calf and Inseam for a performance fit. Removable, insulated liner with rib knit stretch Inseam and knee area. Waterproof side-entry ESO leg zippers and zippered insulated liner allow for ease of dressing. Features 8" pant/jacket zipper attachment with the jacket side zipper included. When the temperature rises, the Tour Master Venture Air 2.0 Pant takes the best of the Venture Pant but replaces the 600 denier Carbolex material with Armor-Link mesh. The Venture Air 2.0 Pant remains waterproof via a two-stage Aqua-Therm liner: the first stage is a waterproof, windproof liner and the insulated second stage can be easily added for warmth. Tour Master's Three Position Knee Armor Alignment System keeps the pant comfortable for all shapes and sizes. 600 Denier Carbolex shell with 1680 Denier Ballistic polyester knee panels for comfort, durability and abrasion resistance. Rainguard waterproof/breathable barrier. Phoslite reflective material panels and piping for increased nighttime visibility. Durable, 1680 Denier Ballistic Polyester seat panel to minimize slipping. Double-stitched construction throughout. Dual-elastic panel waistband with adjustable waist belts. Accordion-style expansion panels at the rear waist and above knees for increased flexibility. Two zippered hand pockets with waterproof lining. Removable, CE-approved knee armor with Tour Master�s 3-Position Knee Armor Alignment System as well as removable soft hip armor. Stretch materials in the calf and inseam for a performance fit. Removable, insulated liner with rib knit stretch inseam and knee area. Waterproof side entry leg zippers and zippered insulated liner allow for ease of dressing. 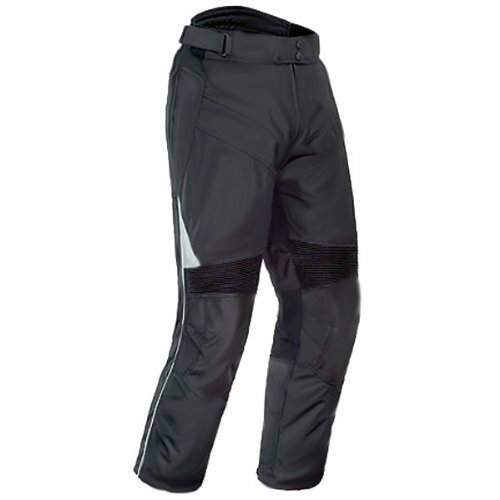 Features 8� pant/jacket zipper attachment with the jacket sides included. 600 Denier Carbolex® shell with 1680 Denier Ballistic polyester knee panels for comfort, durability and abrasion resistance.Rainguard® waterproof/breathable barrier.Phoslite® reflective material panels and piping for increased nighttime visibility.Durable, 1680 Denier Ballistic Polyester seat panel to minimize slipping.Double-stitched construction throughout.Dual-elastic panel waistband with adjustable waist belts.Accordion-style expansion panels at the rear waist and above knees for increased flexibility.Two zippered hand pockets with waterproof lining.Removable, CE-approved knee armor with Tour Master's 3-Position Knee Armor Alignment System as well as removable soft hip armor.Stretch materials in the calf and inseam for a performance fit.Removable, insulated liner with rib knit stretch inseam and knee area.Waterproof side entry leg zippers and zippered insulated liner allow for ease of dressing.Features 8 pant/jacket zipper attachment with the jacket sides included. http://www.revzilla.com/product/tour-master-venture-pants Tour Master Venture Pants available at RevZilla. Click the link for customer reviews, the full description or to buy. 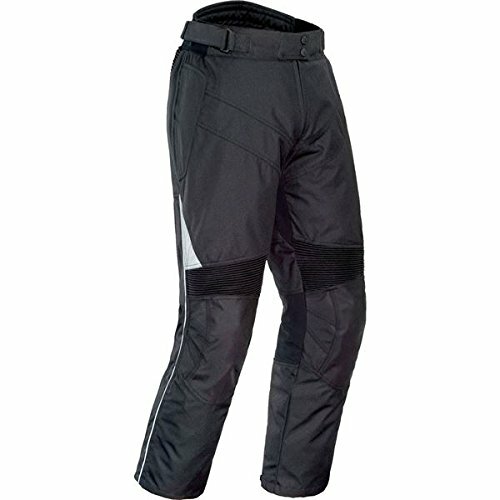 Compare prices on Tourmaster Venture Pants at ShoppinGent.com – use promo codes and coupons for best offers and deals. Start smart buying with ShoppinGent.com right now and choose your golden price on every purchase.